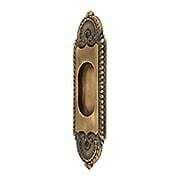 Although the design of this beaded oval pull dates from around 1900, it's a lovely choice for modern, as well as period interiors. Beautifully cast from solid brass, it comes in 7 traditional finishes. Designed in the English Regency style, this large and stately Stanwich Pattern Pocket-Door Pull gives pocket doors a distinguished air. The circa 1900 Lockwood Mfg. 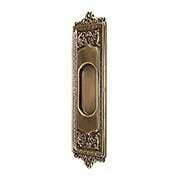 pattern is exactingly reproduced in solid, cast brass, and comes available in three vintage finish options. Designed in the English Regency style, this large and stately Stanwich Pattern Pocket-Door Pull in Antique-By-Hand gives pocket doors a distinguished air. The circa 1900 Lockwood Mfg. pattern is exactingly reproduced in solid, cast brass, and features our hand-applied antique finish that continues to age gracefully over time, developing highlights with use. 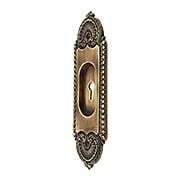 Designed in the English Regency style, this large and stately Stanwich Pattern Pocket-Door Pull with Keyhole gives pocket doors a distinguished air. The circa 1900 Lockwood Mfg. 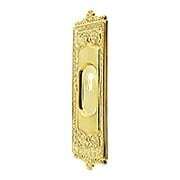 pattern is exactingly reproduced in solid, cast brass, and comes available in three vintage finish options. Designed in the English Regency style, this large and stately Stanwich Pattern Pocket-Door Pull with Keyhole in Antique-By-Hand gives pocket doors a distinguished air. The circa 1900 Lockwood Mfg. pattern is exactingly reproduced in solid, cast brass, and features our hand-applied antique finish that continues to age gracefully over time, developing highlights with use. P. & F. Corbin featured this stately pocket door pull in their 1905 hardware catalog. The "Mantua" pattern, as it was called, features a lavish array of neo-classical ornament and is suited to formal interiors of any era. True to the original, our exclusive pull is reproduced in stamped sheet brass, hand-finished with our living antique patina. 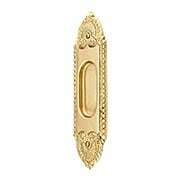 P. & F. Corbin featured this stately pocket door pull in their 1905 hardware catalog. The "Mantua" pattern, as it was called, features a lavish array of neo-classical ornament and is suited to formal interiors of any era. True to the original, our exclusive pull is reproduced in stamped sheet brass with your choice of three popular finishes. P. & F. Corbin featured this stately pocket door pull in their 1905 hardware catalog. The "Mantua" pattern, as it was called, features a lavish array of neo-classical ornament and is suited to formal interiors of any era. True to the original, our exclusive pull is reproduced in stamped sheet brass, hand-finished with our living antique patina. This finish is oiled, but not lacquered, and will gradually develop highlights with use. Simple, elegant, and refined, our Premium Passage Pocket-Door Mortise Lock Set is an excellent choice for a variety of interiors. 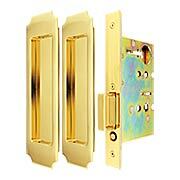 Beautifully designed and crafted, it is suited for single and double non-locking pocket doors. To release the integrated edge pull, simply push the button located below the pull. Choose from a wide assortment of lustrous finishes. Simple, elegant, and refined, our Premium Dummy Pocket-Door Mortise Lock Set is an excellent choice for a variety of interiors. If you have double pocket doors, this beautifully crafted design is the perfect companion to our privacy and keyed sets. To release the integrated edge pull, simply push the button located below the pull. Choose from a wide assortment of classic finishes. 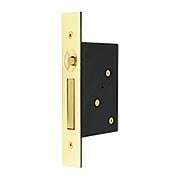 Simple, elegant, and refined, our Premium Privacy Pocket-Door Mortise Lock Set is an excellent choice for a variety of interiors. Beautifully designed and crafted, it features a convenient spring-loaded edge pull for quiet, smooth operation. The depth-adjustable strike makes it easier to install, while self-retractable wing hooks on the latch prevent scratches to the opposite surface. 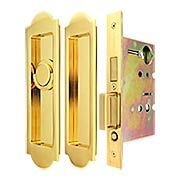 For a complete double pocket door set, combine this locking set with our matching dummy set. Choose from a wide assortment of lustrous finishes. Simple, elegant, and refined, our Premium Keyed Pocket-Door Mortise Lock Set is an excellent choice for a variety of interiors. Beautifully designed and crafted, it features a convenient spring-loaded edge pull for quiet, smooth operation. The depth-adjustable strike makes it easier to install, while self-retractable wing hooks on the latch prevent scratches to the opposite surface. 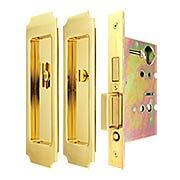 For a complete double pocket door set, combine this locking set with our matching dummy set. Choose from a wide assortment of lustrous finishes. Crisp, clean, and tailored, our Chamfered Corner Pocket-Door Flush Pull is an excellent choice for a variety of interiors. Beautifully designed and crafted, it comes in a wide assortment of lustrous finishes. Crisp, clean, and tailored, our Premium Passage Pocket-Door Mortise Lock Set is an excellent choice for a variety of interiors. 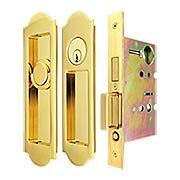 Beautifully designed and crafted, it is suited for single and double non-locking pocket doors. To release the integrated edge pull, simply push the button located below the pull. Choose from a wide assortment of lustrous finishes. Crisp, clean, and tailored, our Premium Dummy Pocket-Door Mortise Lock Set is an excellent choice for a variety of interiors. If you have double pocket doors, this beautifully crafted design is the perfect companion to our privacy and keyed sets. To release the integrated pull, simply push the button located below the pull. Choose from a wide assortment of classic finishes. Crisp, clean, and tailored, our Premium Keyed Pocket-Door Mortise Lock Set is an excellent choice for a variety of interiors. Beautifully designed and crafted, it features a convenient spring-loaded edge pull for quiet, smooth operation. The depth-adjustable strike makes it easier to install, while self-retractable wing hooks on the latch prevent scratches to the opposite surface. 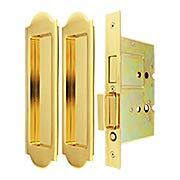 For a complete double pocket-door set, combine this locking set with our matching dummy set. Choose from a wide assortment of lustrous finishes. "Refined simplicity" defines the timeless style and charm of our Premium Patio Pocket-Door Mortise Lock Set with Arched Pulls. Beautifully designed and crafted, it features a convenient spring-loaded edge pull for quiet, smooth operation. The depth-adjustable strike makes it easier to install, while self-retractable wing hooks on the latch prevent scratches to the opposite surface. 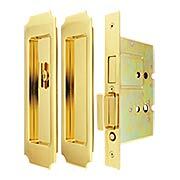 For a complete double pocket door set, combine this locking set with our matching dummy set. Choose from a wide assortment of lustrous finishes. The lock is activated from the inside by the u-shaped thumb turn. 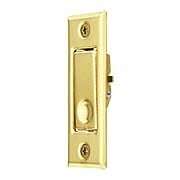 The latch bolt is held in place by the included strike or dummy mortise case (for double doors - purchase separately). "Refined simplicity" defines the timeless style and charm of our Premium Patio Pocket-Door Mortise Lock Set with Chamfered Corner Pulls. Beautifully designed and crafted, it features a convenient spring-loaded edge pull for quiet, smooth operation. The depth-adjustable strike makes it easier to install, while self-retractable wing hooks on the latch prevent scratches to the opposite surface. 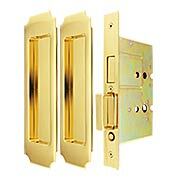 For a complete double pocket door set, combine this locking set with our matching dummy set. Choose from a wide assortment of lustrous finishes. The lock is activated from the inside by the bow-shaped thumb turn. The latch bolt is held in place by the included strike or dummy mortise case (for double doors - purchase separately). 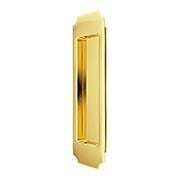 Our solid brass 6-Inch Standard Pocket Door Edge Pull is a cut above the flimsy models typically found at builder's supply stores. 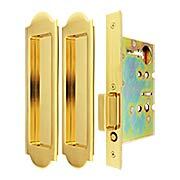 Forged from 1/8-inch thick brass with a spring loaded pull, it is equipped to provide years of service. 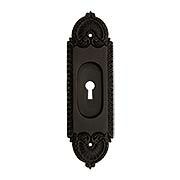 Available in a host of finish options, it is ideal for use with decorative pocket doors, or as a stand-alone piece. 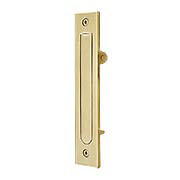 Our solid brass 4-Inch Standard Pocket Door Edge Pull is a cut above the flimsy models typically found at builder's supply stores. 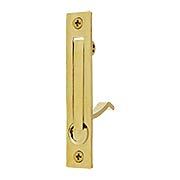 Forged from 1/8-inch thick brass with a spring loaded pull, it is equipped to provide years of service. 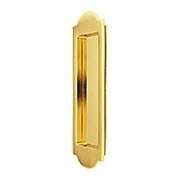 Available in a host of finish options, it is ideal for use with decorative pocket doors, or as a stand-alone piece.